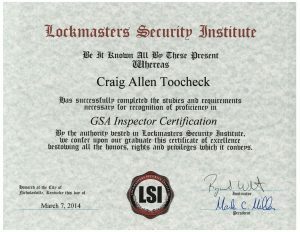 A Certified GSA Technician Is Versed In The Methods And Requirements To Allow The Container To Remain In Use After The Opening Procedure And With Proper Repairs Made To The GSA Unit, When Applicable. GSA Label. When locked-out containers or doors are opened in a manner that causes damage to the product or reduces the security of the product, the GSA approval label must be removed. Proper opening and repair of containers and vault doors allow the GSA label to be retained and will not require recertification of the container or vault door. 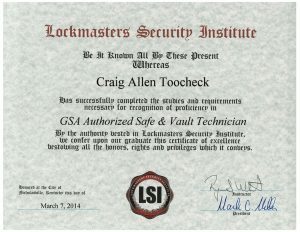 Proper opening and repair of containers and vault doors allow the GSA label to be retained and will not require recertification of the container or vault door.